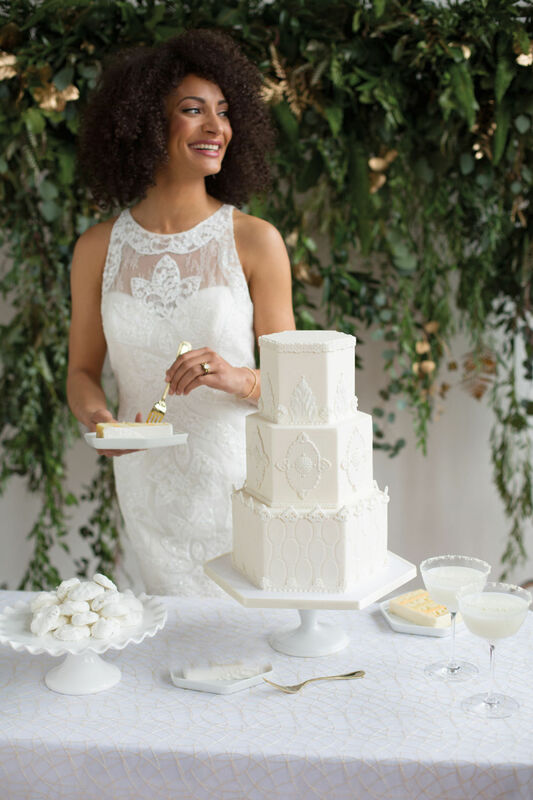 Inspired by opal milk-glass patterns, Carla Reich, owner and pastry chef at Honey Crumb Cake Studio, modernized traditional hexagonal tiers with an embossed oval design, hand-piped details, and molded sugar filigree medallions. “By playing with the different shapes and techniques, I was able to create a whimsical look that is also elegant and quietly stunning,” says Reich. 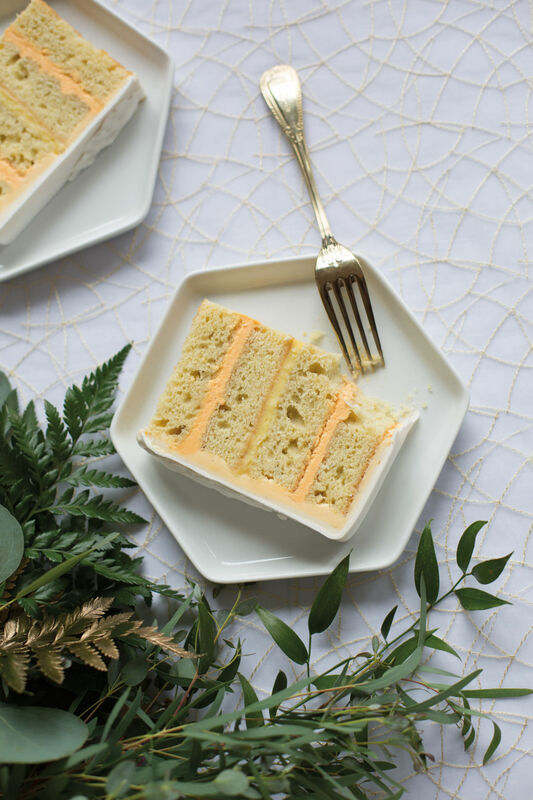 The lime-flavored cake’s passion fruit mousseline and blood orange Swiss meringue buttercream offer a fresh (and delicious) color element to the otherwise monochrome cake. 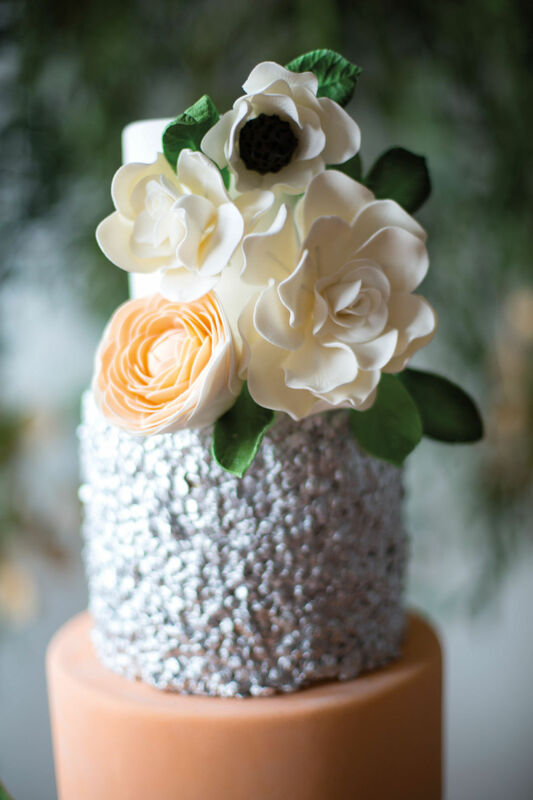 “This cake just screams ‘life of the party,’” says The Sweet Side owner Kara Burfeind of her five-tier silver confetti almond sponge cake with apricot filling. Hand-molded sugar flowers lend a sophisticated touch in cantaloupe hues with big pops of white and refined black accents. 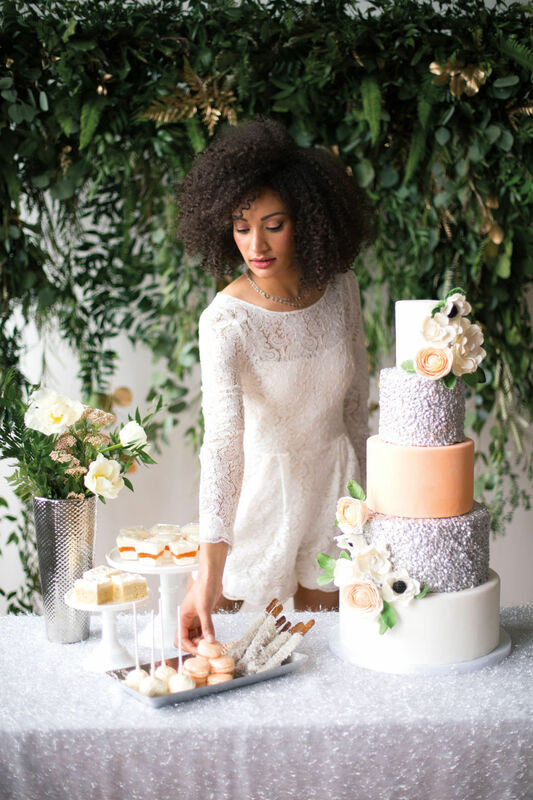 Burfeind’s other coordinated textural treats—vanilla cake pops, apricot cheesecake shooters, French macarons, and sugar cookie bars—enhance the “more is more” vibe for a statement-making spread that still feels cohesive. Table Setting Hoffman selected a silver shag table linen from Creative Coverings to create a unique, festive base that plays into the personality of the cake itself and mimics Burfeind’s coconut-covered pretzel sticks. Employing popular cake-decorating techniques and trends—hand painting and bright metallics—Natalie Vorpahl and Kristina Serfass of Baked in West Seattle crafted this vivid, mixed-media confection made of a decadent dark-chocolate fudge cake layered with chocolate ganache and salted caramel cream. “We envisioned a modern, edgy couple who wanted a touch of romanticism and funk,” says Vorpahl. 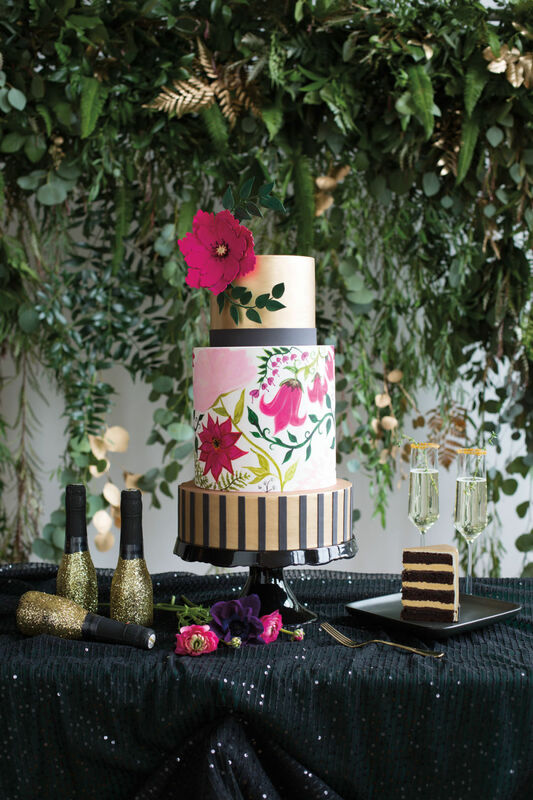 If you like the painted look, the Baked gals can work to brush on a masterpiece incorporating specific wedding elements like your floral choices, exact color palette, or even patterns from your invitations and place settings. Table Setting “The playful sexiness of this cake is so fun to design around,” says Hoffman, who draped the table in a disheveled Creative Coverings sequin linen and upped the glam factor with gold-sugar-rimmed cocktails and sparkly Champagne bottle favors from Chic Ink in Issaquah. 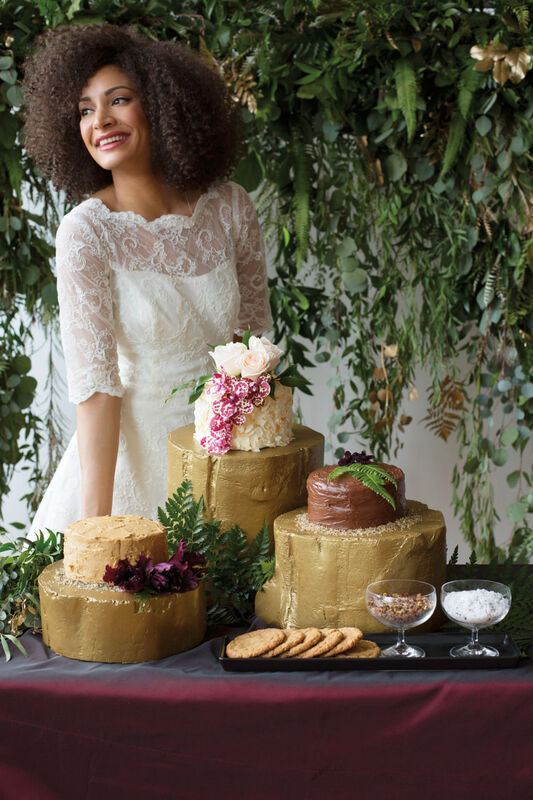 “I love that these cakes can work both as desserts and centerpieces,” says Suzanne Rosellini of Rosellini Sweets. Individual cakes—like these rough-textured dark chocolate espresso, toasted coconut, and classic chocolate rounds—allow you to offer more flavors and, as Rosellini suggests, to place the desserts directly on guest tables for tasty focal points. Natural flower toppers marry the traditional confections with the rest of the serene, bohemian style. Table Setting How to display such rustic sweets? Hoffman handmade the pedestals from logs that she painted gold. If you’re DIYing, be sure to finish the job by applying a food-grade sealant to the blocks.